I’ve already written at length about the ways in which Pokémon: Let’s Go, Pikachu and Eevee remake the original Generation 1 Pokémon games (for the second time) while still delivering a new, fresh experience. However, as a longtime fan of Pokémon in general, I was also thoroughly impressed by the subtle changes that the game makes to its narrative in order to ensure that the experience is as rewarding for longtime Pokémon fans as it is for newcomers. In Let’s Go, Game Freak is expertly able to cater to fans’ nostalgia while also subverting expectations created by said nostalgia – and the first moment in which I came to appreciate their ability to pull this off came with the arrival of Blue. It should be noted that I initially found Blue’s appearance in this game to be a bittersweet one, if only because I was highly disappointed at the start of the game that he wasn’t your rival in this iteration of the Gen 1 storyline. Your rival, whose default name in Let’s Go is Trace, is still your next-door neighbor in Pallet Town – but he bears no relation to Professor Oak, and his demeanor is downright welcoming compared to the active hostility that Blue showed you in the original games, as well as FireRed and LeafGreen. Initially, this turned me off to the character – I always enjoyed the first two Pokémon generations’ decision to make your rival an irredeemable jerk; it only added to the sense of satisfaction felt upon crushing them in high-stakes Pokémon battles. However, this sense of disappointment was quickly offset by sheer delight following my completion of Let’s Go’s first gym battle, when you discover that Blue is actually in these games after all as he greets you outside the Pewter City Gym. In the version of Kanto that exists in Let’s Go, Pikachu and Eevee, Red and Blue’s adventure actually happened several years before yours – in a time in which devices such as the Pokédex were just a gleam in Professor Oak’s eye. In brief references that Blue makes to his younger years, he describes a world in which he and Red had to mark Pokémon locations on their map in a decidedly analog fashion, expressing envy towards his grandfather’s invention. This also means that Blue has already gone through his period of egotistical, spoiled entitlement, and has aged into a hero to the people of Kanto. References are made to repeated attempts to get him to assume the title of Viridian City gym leader, and it’s easy to see why – in this version of Kanto, Blue is one of the most take-charge personalities you’ll encounter on your adventure, personally coordinating aspects of your quest to destroy Team Rocket. However, Game Freak also keeps the spirit of a younger, more familiar Blue alive – he still signs off with “smell ya later”, although it seems like it’s just become habit now rather than an intentionally hostile address. Additionally, during a late-game encounter with Blue and Professor Oak, the writers pay homage to the original Red and Blue’s famous introduction, in which Oak infamously forgets his own grandson’s name. These small, yet meaningful narrative choices don’t just help to establish characterization and relationships, they also add a profound degree of depth to Let’s Go’s storytelling, which is wholeheartedly welcome given Pokémon’s reputation for being shallowly written. Adding levity to the first of Pokémon’s many plotlines centered around an evil crime syndicate, Jessie, James and Meowth serve as the bumbling, idiotic face of Team Rocket, appearing at the site of every one of the group’s evil misdeeds while also making brief cameos throughout the world at large. 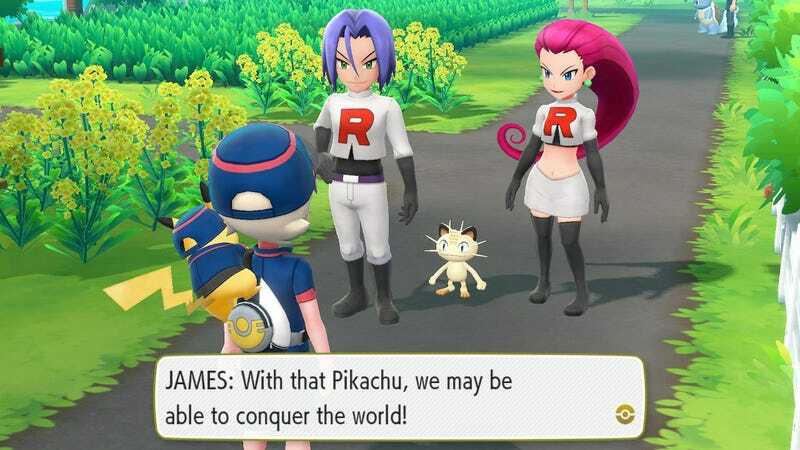 They serve an interesting function in Let’s Go in that they grant a degree of characterization to Team Rocket that, in the original titles, didn’t really exist until the late-game introduction of Team Rocket’s leader, Giovanni. Sadly, this results in a bit of a narrative trade-off – while Jessie, James and Meowth are hilariously true to their anime origins, this robs Team Rocket’s early efforts of any sort of danger that one might associate with a crime syndicate; they’re simply too ridiculous to be taken seriously. Other iconic Pokémon mainstays get the spotlight in Let’s Go, Pikachu and Eevee. As one would hope given Blue’s presence in the game, Red also inevitably makes a postgame cameo – and in typical fashion, has no dialogue whatsoever beyond infuriating ellipses with varied punctuation, keeping him as silent as he was in his days as a protagonist. Even Green, who, depending on your preference, hails from either the Pokémon Adventures manga or FireRed and LeafGreen, makes an appearance here, sporting a whimsical personality that may or may not raise a few questions about the relationship between humans and Poké Balls. Perhaps one of my favorite things about Pokémon: Let’s Go, Pikachu and Eevee is that they even leave room open for these characters to have futures. By the end of the main storyline, Blue has accepted his role as Viridian City’s gym leader, foreshadowing his role in the Gen 2 games (and potentially setting up a hypothetical Let’s Go sequel). Jessie and James, in a post-game encounter, are shown to have responded to Team Rocket’s destruction with a relative degree of positivity. They voice their desire to possess your partner Pokémon, begrudgingly admit that your interactions have been somewhat fun for them, and then blast off one last time, flirting with their better natures in a scene that evokes their anime counterparts’ occasional struggles with morality. It would be fun to see Let’s Go become a Pokémon sub-franchise with a greater emphasis on continuity – given that there are seven pre-existing generations on which to construct a sturdy foundation, it’d probably be pretty easy. That said, either way, these cameos add just another layer of depth and texture to a game that I had gone into with pretty low expectations, and I can’t wait to see what Game Freak accomplishes going into next year’s core title – and beyond.